This post marks the 14th and final installment in my “Christmas in July” photo-post series. 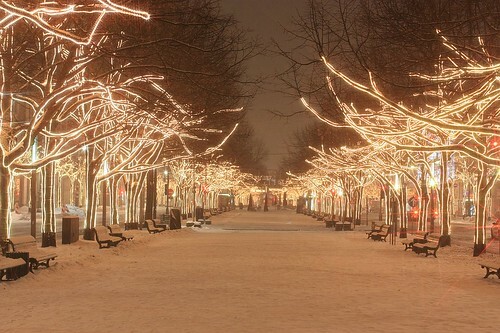 Berlin, Germany – 11pm, 24 December 2010. Judging from my Flickr set, it’s easy to see why I enjoy visiting Berlin. I’ve always had this idea of coming back and photographing a number of sites around Berlin during the winter holiday season. The city slows down, becomes a little quieter, and sits back as if to take a breather. These were precisely the reasons why I wanted to come back. The huge bonus was the snow, both on the ground and in the air. With steady snowfall and gusty winds, the scattered light created a diffuse glow, which hovered above the city and permeated throughout all of the photos made on this night. Unter den Linden, or “under the linden/lime trees” is a wide tree-lined boulevard, which runs east-west through the Mitte, from Brandenburg Gate and the edge of the Tiergarten in the west, to Museum Island in the east. The record goes back as 1647 when the first set of trees were planted. 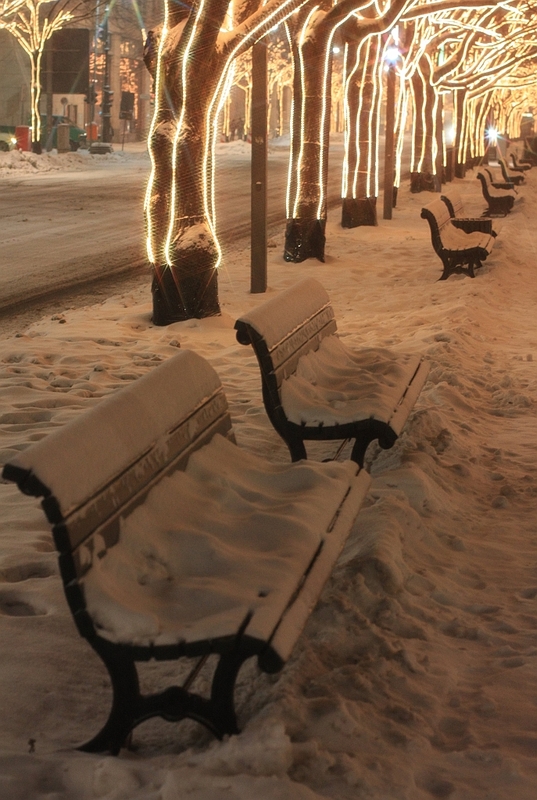 On a quiet late evening with little vehicular and pedestrian traffic, surrounded by falling snow and lights on in full force, photographic opportunity would not be denied. All lit up on Unter den Linden, Berlin Mitte. 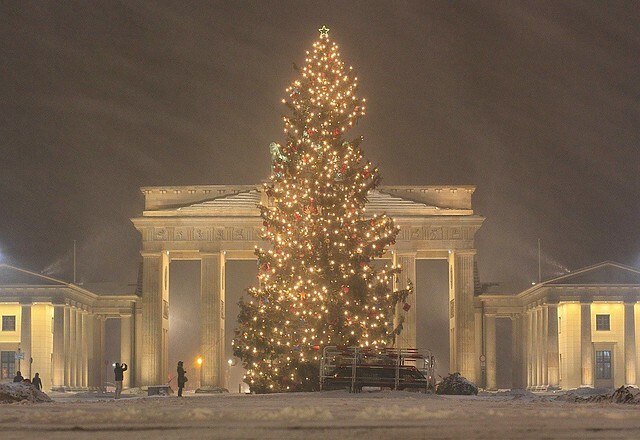 While Brandenburg Gate is visited and photographed by many, it’s hard to beat a relatively straight-forward photo like the one below, made just 12 minutes before midnight and the advent of Christmas Day. The diffuse diagonal patches are streaks of blowing snow against the darker background night-sky. Pariser Platz, Brandenburg Gate, Berlin. As I wrote above, this is the final installment in the “Christmas in July” photo-post series. I hope you’ve enjoyed following and reading this series, as much as I enjoyed making these photographs and writing about them. I made the three photos above in Berlin on Christmas Eve 2010. This article was posted originally on Fotoeins Fotopress (fotoeins.com).